Over the years, I have been asked many times how I go about designing a space. There are certainly times when I (try to) let a room evolve naturally. However, I have learned that I prefer a more pulled-together and tailored aesthetic, which is often easier to achieve when I spend a little time planning out the design up front. From some basic room “analysis” and searching for inspiration images, to sourcing items and assembling a design board, I’ve nailed down a loose “system” that allows me to transform room after room in house after house without spinning my wheels (too much!) while doing it. I’m not a trained designer, but I do feel confident executing my design ideas. 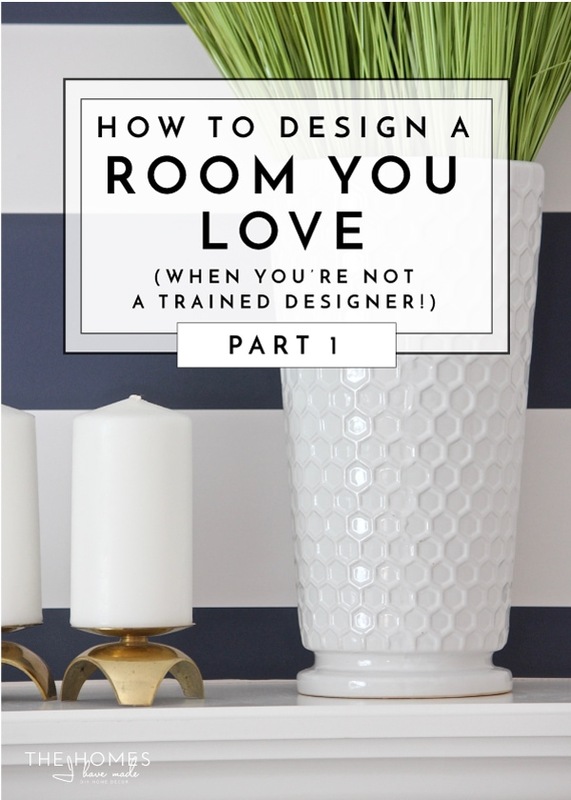 So today I want to show you the process I use to design a room I love so you feel empowered to do the same in your own home! Note – This turned into a monster-of-a-post so I am going to break it into two parts. I’ll update this post with a link to the rest once it goes live in a few weeks! 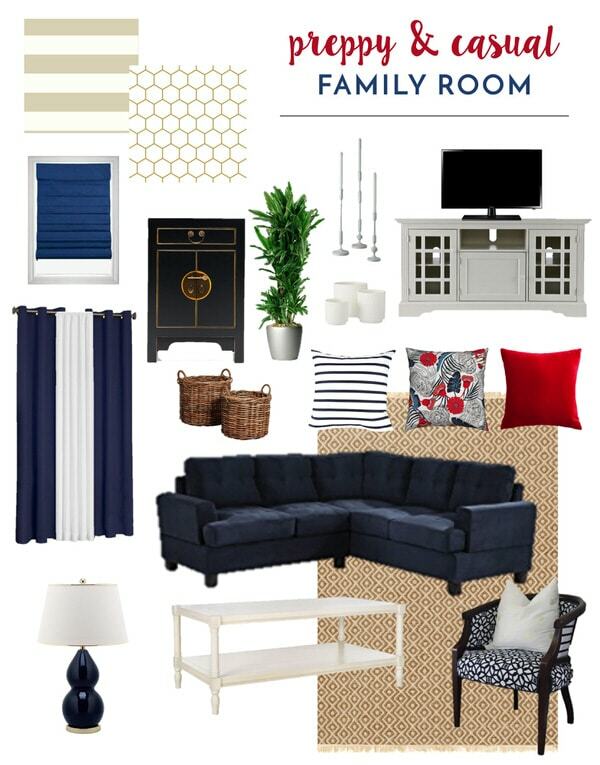 I am in the process of “finalizing” the design for our family room; so instead of talking in generalities, I thought I would walk you through how I’m making decisions for this space (and give you a sneak peek at where I’m headed). Even though I am focusing on a specific space, I follow a very similar process for each room I work on. Let me show you how I do it! Everyone’s starting spot will look and feel different. You might have a completely empty room that needs everything from paint and furniture to accessories and lighting; you might have a completely finished room that needs a minor refresh; or you might be somewhere in between. Before you buy or do anything to the space (especially if you’re just moving in), I recommend spending a good amount of time in the room. Only after living in a space for a little while can you figure out how you truly use the room, how the lighting looks during various times of day, what kind of vibe you want for the space, what’s missing in the space, and the optimum flow about the room. What is the primary purpose of this room? Who primarily uses this room? Does this room need to be kid-friendly? What items need to stay? What items have to go? What can be changed? What can’t be changed? What functions are missing? What current functions are not being used? What eye-soars need to be remedied? Is there enough furniture? Is there too much furniture? What do I love about this room? What do I hate about this room? How do I want this room to feel? Before getting started, I also recommend taking pictures of your space from every angle. Not only is it handy to have some decent shots while you are researching ideas and out shopping, but it’s also fun to look back at them once the room makeover is complete! These two photos are how our living room has sat for the last 7 months. During that time, we sorted out the overall flow, layout, and function of the room but I’ve had major difficulty moving past the brown walls and brown carpet (both of which HAVE to stay) to come up with an overall design I love. Other things that have to stay? 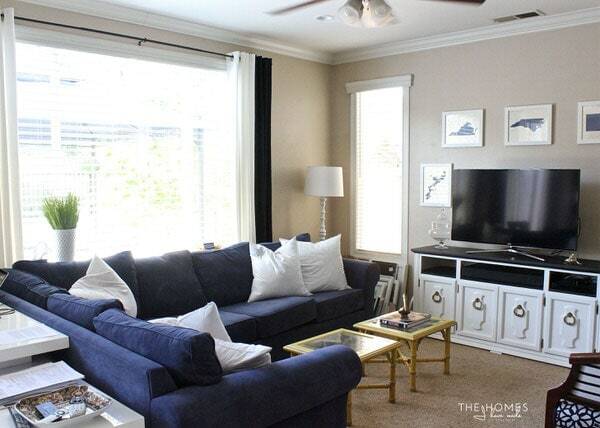 The TV stand, blue couch and patterned club chairs. Everything else is fair game for makeovers or replacement. The next step in my design process is to gather inspiration. This step, too, will look different for each person/room/makeover. 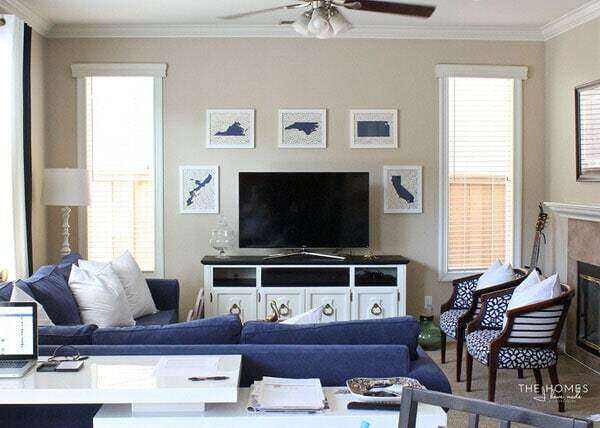 For a completely blank room, when you want to do an entire makeover from scratch, or you really just have no idea which direction to head, I recommend surfing Pinterest and pinning any and all images that speak to you. 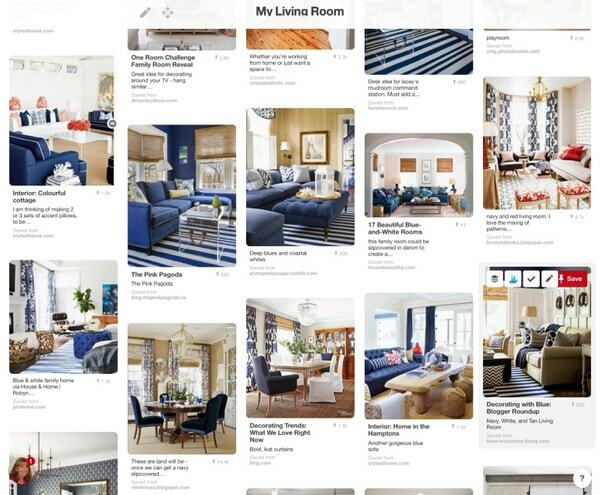 Start a dedicated board and pin any images with colors, patterns, overall looks, styles, lighting, and layouts you love. Collect as many images as you can, and don’t worry too much about pinning down (ha!) a speicifc design. Once you’ve collected a lot of images, spend some time analyzing them for common threads. Is there a style reflected in all of them? A certain color palette? A pattern used most often? My hunch is there will be a some sort of consistent element through many of your inspiration images. Once you nail down those elements that are speaking the most loudly to you, continue to look for even more images. This time, focus on finding examples of rooms that use those elements in really strong and stylish ways. Delete (or move) pins off your primary board that no longer match the design direction you’ve (loosely) settled on. Continue to refine and refine and refine your search images and Pin Board until it reflect a solid direction for your room makeover. Because our family room already has some pre-determined elements, I used a slightly different approach to source inspiration. When there are specific room elements that need to be considered, don’t just look for any picture that inspires you. Instead, look for rooms that include some of those elements. 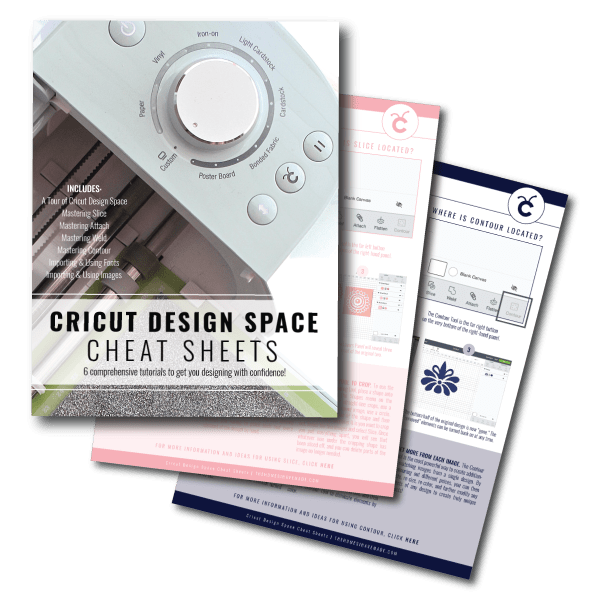 Whether it’s a specific wall or furniture color, floor covering, kitchen layout, or a throw pillow you fell in love with at Target…find examples of how trained designers used those elements in really effective ways. For example, I cannot get rid of our brown walls, brown carpet and blue couch, so I especially looked for and pinned images that included these elements. Not only do these inspiration images provide some visual guidance for the design process, but they can also help you view items you have in new and refreshing ways. 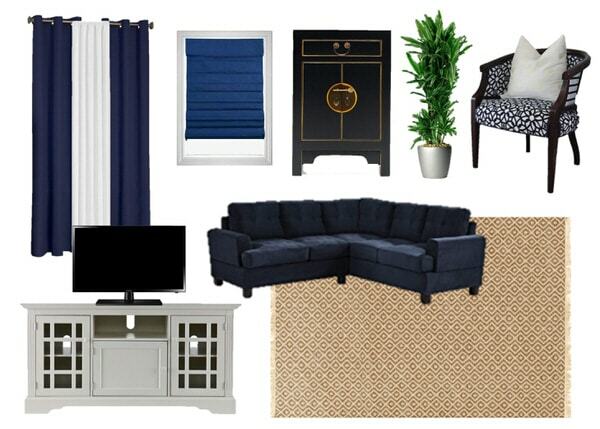 For our living room design plan, I pinned a bunch of rooms that not only have brown walls and a blue couch, but also reflect the comfortable yet pulled-together style I want for our home. Not every room is a perfect example of what can be accomplished, but seeing the rooms collectively (above) showed me how well this color color scheme can actually work. I continued to analyze my pictures and pulled out four that provide me with a concrete and doable vision for our room. It’s very difficult to design a room, no matter the style, without some sort of color palette guiding many of the decisions. 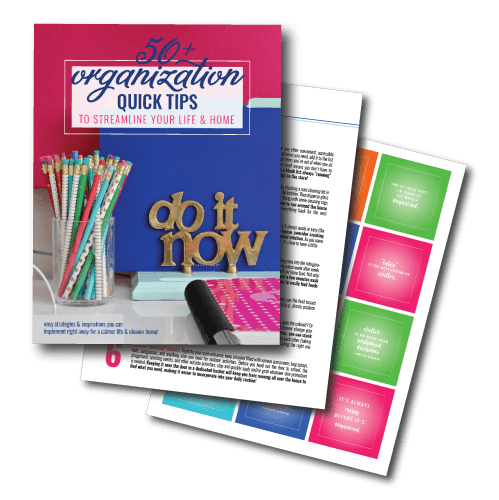 To determine a color scheme, refer back to your inspiration images and identify colors (or groups of colors) that you love and/or work with items you already have. 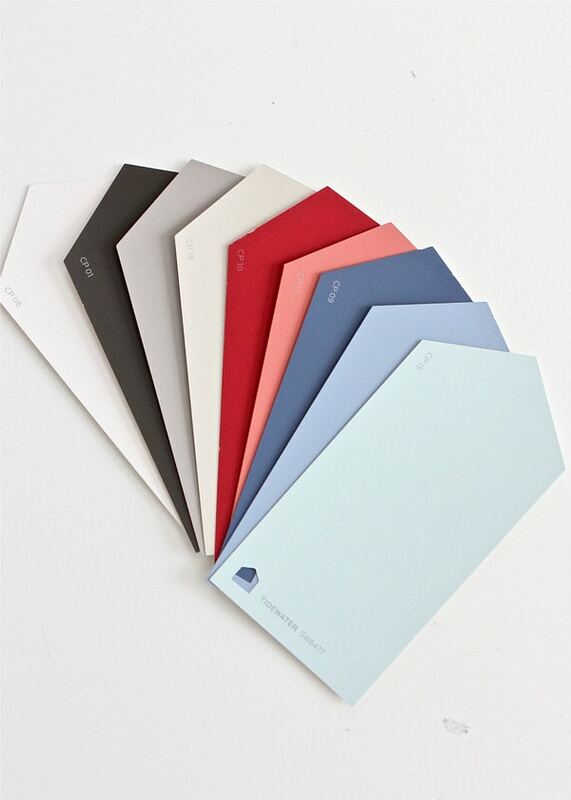 Collect paint chips or some other small items in potential colors schemes (e.g., fabric swatches, scarves, book covers, throw pillows) and bring them into your space to see how they work with the lighting and other elements already in the room. 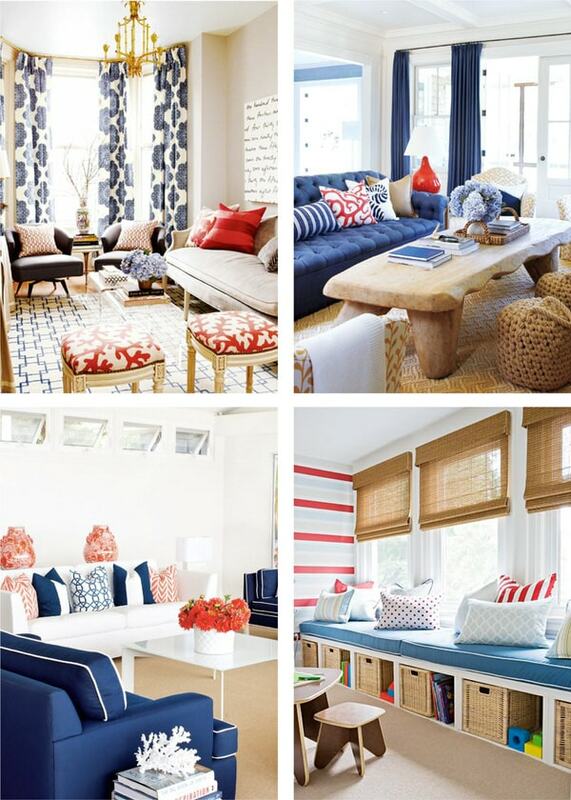 Continue to play with colors until you find a combination you love AND works in your home. Using the above pictures as guidance, as well as referring to my plan for a whole home color scheme, I chose coral, red, and lighter blues to work with the browns, blacks, whites and dark blues already in our space. You might recall that I don’t use the paint chips to necessarily determine wall colors, but to instead see how various colors work together. The beige paint chip is reflected on the walls, the dark blue paint chip on the couch; the black and white tones are reflected in the wood furniture. This means the entire scheme will need to be brought together via accessories in the other colors: red, coral, and light blue. All fanned out, I can see this is a color combination I love and will work without having to buy anything yet! Having a design plan is a bit more than just picking a color scheme. It’s also about figuring out what items could/should be brought into the room and determining if and how they will all interact. Essentially, you will need to find the items to bring those inspiration images to life in your own home. As such, the next step is to hunt and peck around the web (or in stores) to find items for your room. 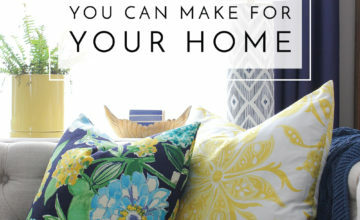 Using your inspiration images as a guide, search Google and your favorite home sites for various items (or take snapshots while out shopping). From foundation items to accessories, consider everything you may want or need in the room and try to find a picture of it. Even though you are focusing more on aesthetics than feasibility at this stage, it is important that you keep the price, scale, and accessibility of items in mind as you collect pictures. As far as saving images of items you find, there are a few options. You can Pin them to a new board, save them to a file on your computer, or take screen shots and keep them on your phone or mobile device. I am going to go into the technical side of saving, editing, and using images to create a design board in another post coming up (it was way too much to cram into this post). 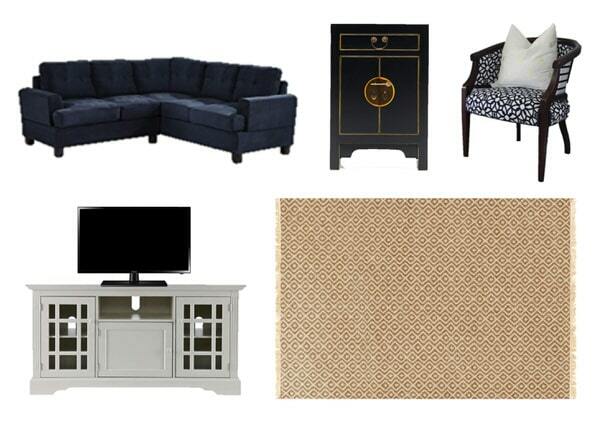 I then sourced new items for the room according to my wants, needs, and vision . My primary goals for this room are to (1) makeover our existing square coffee tables (but I don’t know what color); (2) add some statement lighting (but I don’t know what style) (3) add patterned pillows to the couch (but I don’t know which fabrics) (4) brighten up the walls (but it has to temporary and can’t be paint) and (5) add interest through different textures. After lots of searching around and considering lots of options, here are the items I found that could help me meet those goals. Note – some of these items are specific ones I am considering (like the lamps and fabric); while others are just representations. The table options, for example, are various colors I am considering painting our square tables, so these images help me visualize various items together before making the “final” choice. Sometimes just sourcing the various items for a room and seeing them all together on a computer screen is enough to get a sense for how a room will come together. More often than not though, I get to a point where I just need to see things side-by-side so I can make an informed decision or choose between specific items. This is where I will play with all my various saved images in a primitive “mock up” of my room on the computer. 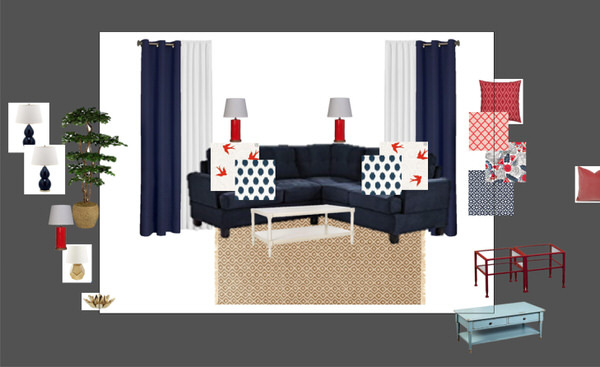 For our family room, I had a difficult time envisioning which fabric + table + lamp combinations would work best, so I created an almost-cartoon-like version of our room using all my saved images. After swapping out all the various colors and options I showed above, I quite quickly landed on a look I liked best. I will often create a mock-up of each wall in the room. It’s far from realistic, but seeing these renderings side-by-side give me a pretty good sense for how the room might come together in real life. Creating these room “renderings” might look hard and tedious, but I have a super simple and easy way to do it. Keep an eye out for an upcoming post where I show you how to do it in just minutes! A virtual mock-up is great for ruling out certain items, determining which colors and patterns play nicely together, and determining if a room has good visual balance. However, nothing can replace real life since it can be VERY difficult to account for size, scale, and color on a computer screen. Once you’ve narrowed down choices for things like paint, fabrics, flooring, wallpapers, rugs, etc, I can’t recommend finding/ordering samples enough. What looks like a good pairing on a computer screen might not work in real life at all, and you don’t want to get too far down the road in a design if some (big) elements don’t work right. Ordering samples is also a great way to finally make a decision if you are truly stuck and the virtual mock-ups don’t help. I find fabrics really hard to figure out on a computer; but as soon as I am holding them in my hands, I can make a decision pretty quickly! After playing around in your “virtual room” and getting some samples in your hands, you should be able to make some decisions and eventually “finalize” the design plan (at least enough to get started!) You can certainly stop planning here and just get executing; however, I like to go one step further and actually put a cohesive design board together. It can be virtual (my preference) or in real life with samples and swatches. It certainly doesn’t need to be fancy or professional, it just needs to make sense to you! The goal is to get all your paint colors, fabric choices, furniture selections and other accessories pulled into a single snapshot that you can reference when you get stuck or are out shopping. I usually keep images (like the one below) on my phone, so when I stumble upon something that might work in the space, I can refer to the plan an instantly determine if the potential item will work or not. It’s important to note here that I use this design board mostly as a creative direction for the room rather than a detailed shopping list. Not only does it give me an at-a-glance reminder of the style and direction for the space (so if I find something I hadn’t yet considered, it can help me figure out if it will “go”), but it also helps me keep track of the things I am looking for while out shopping. Right now, I have a lot of the larger items set, but I am keeping my eye out for blue lamps, red pillows, striped pillows, multi-colored pillows, some woven baskets, white planters, and some curvy candlesticks. This guided shopping list allows me to keep an eye out for deals and sales and also nudges me to actually buy an item (instead of hemming and hawing over it for hours/days/weeks). Phew! Did you make it this far? Gosh, I feel like I explained so much while explaining nothing at all. 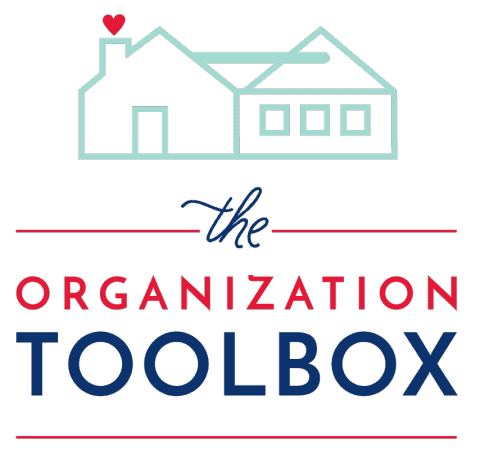 The truth is, putting a room together can be a very organic, fluid process. And while it’s not at all a straight line from Start to Finish, the steps I outlined here do get me making decisions and executing rooms with confidence. I hope you enjoyed this peek into my process and also seeing where we are (finally) heading with our family room. As you might expect, even though the plan is “done,” the design continues to evolve as you start installing the space. And that’s where I’ll pick up in Part II. I’d love to hear how you go about designing a room. 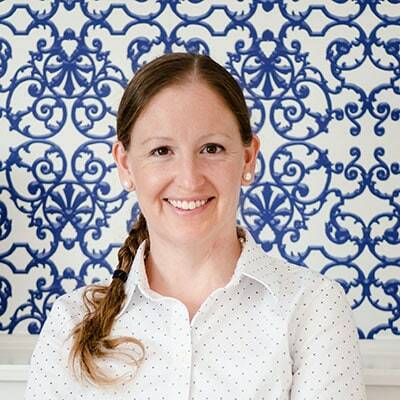 While I feel like I have a system that works for me, I always love hearing and incorporating smart tips from others! Please feel free to share in the comments! 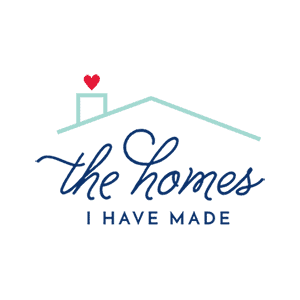 Next week, I’ll be taking a break from this “design school” and share a fun labeling project I know you’ll love! See you then! Yay, yay, YAY! Thank you Megan! I’m a big function over form person myself, so I’m with you on working out how you need the room flow before making it pretty. Ooh, ooh, now my creative juices are flowing! WOW! This was amazing and so, so helpful – hurry, hurry with the next step, PLEASE? The technical aspects of your gorgeous mood boards are befuddling and I am anxiously awaiting your skillful explanations. LOVED this post – thank you from the bottom of my heart. I totally needed this! My living room feels pretty blank, it has stuff in it. But is it what I really want it to look like? I need to go back to the drawing board and pick stuff I really love….not hand me downs. 🙂 Thanks so much! I love everything about this post! I totally need to do this. You lay out everything so well. One question though…what about a budget? Maybe it should be “Step One”? 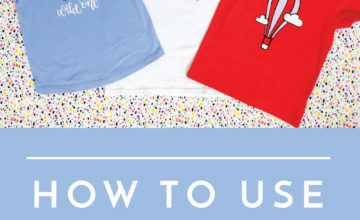 This is such an incredibly helpful post—thank you so much for breaking it down for us!! Loving the direction with the room your going! What a great process! I need to use this to make a plan for my living room. We bought a couch/loveseat set and hung curtains in the month after moving…and it has sat just like that for four more months now! Bare walls, no rug, and the throw pillows that came with the furniture. Love your system and it gives me great direction for planning my space. So much information! I have followed your blog for years now and this post has been my favorite. Thank you so much for the inspiration! Hi. What do you recommend when you have a small room(9*12) and no playroom in the house for all the kids toys. I try to hide stuff in their closets but they are also small closets and its not like they have tons of toys. Any suggestions? Thank you. Can you move a bulk of the toys to the kids bedrooms? 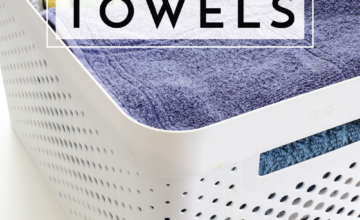 Toys will always trickle into the living spaces, so it’s good to have some baskets or storage furniture to catch things, but if the bulk can be moved out it might help! Hi, just wondering if you ever did the part 2? I’ve done a search but couldn’t find it. Did you label it something else? Interested in the rest. I am actually still working on Part 2. It should hit the blog before the end of the month! Thanks for checking in, and I’m sorry about the delay! That’s a really great question…and honestly, it just takes some trial and error until you start to see the images you need. Pinterest CAN be very overwhelming and frustrating. I start by being as specific as possible, so in your case, I’d start with “wood floors red family room” or something along those lines. Then, as you start to see images come up that you like, you can narrow down what you type in. For example, say you find a picture of a red room with flowered drapes that you really like. You can then start to look for images using “red family room flowered drapes” and then see if you can find an image that has even more elements you love (or even specific drapes/fabric you want to use). It can be circuitous and you may not be able to find images that have EVERYTHING in one shot, but you can start to collect various images that have different elements of what you like. One more thing to try, when you click into a pin, Pinterest now populates a bunch of pins underneath that correlate to the picture in some way. If you see a picture with a few elements you like, click into it and then surf all the related pictures underneath. It may take you down a rabbit hole but you can refine that way too! Hope that helps enough to get you started! Let me know if you have more questions!